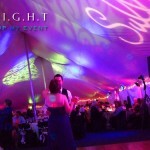 We create an custom name image together and project this either behind the head table or onto the dance floor. There are over 27 unique sample for you to choose from. Already have a design in mind? Just attach the artwork to the e-mail and we will make it for you. We can even use the same monogram that you had designed for your invites. This is a great way to tie together all your small details. We even give you the metal name cutout at the end of the night as a personal memento. This way you can scrap book it, frame it, or get really crazy and rent a stage light on your anniversary and put it up in your living room! How memorable would it be to dance inside your name? Image all the opportunities your photographer will have taking shots of your 1st dance. If you look at the images below you can see some samples of custom designs. 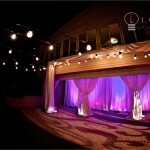 Patterns help to bring out prominent features in your venue. This is popular requested to give depth to your design (lighting on the walls with patterns over it). When you combine these two elements it gives a one-of-a-kind look. If you want a lighting effect that goes above and beyond, then this is for you. These intricate designs give a contemporary look to wedding receptions. Think about how a whispy baroque pattern would look on your ceilling. You could use objects scattered across your wall to work with your theme. For tent canopies this effect works wonders. Patterns is one of the most over the top ways to enhnace your space. For more information, contact Encore to discuss possible options for your event. Working with Water? We Got You Covered! If you are working with a water theme, then this if perfect. Encore’s H20 lights can recreate the ocean glare. This effect does such a great job, that it actually looks like you are in a large aquarium. There is no need to change anything your venue, this light does it all. Click on the picture towards the left. You will see how it was used to make a hallway look amazing. Besides water, this fixture can look like smoke in a variety of colors. You would expect aqua and blues, but we have 5 more colors. Depending on your theme, we could program a different color. What makes Encore’s H20 fixture different from others, is that this uses an intense 50 watt lighting element. Compared to other fixtures, ours is twice as bright. This helps for areas that have windows and gives a more saturated look. We recommend having this light directed on your ceiling or dance floor. We would like to invite you to our comfortable studio to demo this impressive effect in person. Another way you can highlight your wedding reception is by lighting up your ceiling. Instead of using a color wash, you can give an open sky effect with our starry ceiling. This requires high powered fixtures with moving patterns that shine onto your ceiling. The end result gives the illusion that your building has no ceiling. A majority of forest, fall, and outdoor winter themes request this effect. Bring the outside inside with our constellations ceiling. Your family and friends will be captivated by the results. Now this effect is great for wedding reception. The last thing your guests will expect is for you to dance on a cloud. It always is great to see the reaction from guests when the cloud starts to bellow out. This looks great when done for grand entrances, dances, and other formal highlights. This is not a fog machine. We use specialized dry ice which keeps the cloud low and controlled. It floats just 6 inches off the ground. When combined with our City of Lights moving head spot lights you can have any color cloud. IMPORTANT: Due to the schedule from our local dry ice vendor on the weekends, we can not offer the Dancing on a Cloud package for Sunday events.